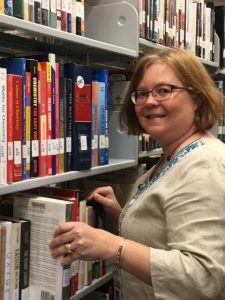 Lisa Payne has been the Open Educational Resource Librarian at John Tyler Community College since July 2017. Prior to that, Lisa has extensive experience working the library field, working in both public and school libraries. As the OER Librarian, Lisa is dedicated to providing information on free, accessible resources to students and faculty. Lisa received her Masters of Library Science at Catholic University of America, and a Bachelor of Science in Parks, Recreation, and Leisure Studies from University of North Carolina. I was born in the foothills of North Carolina, but have lived in Virginia for over 25 years. I am the mother of two young adults – one attends college at Shenandoah University and the other is a UVA graduate living and working in Atlanta. My husband and I enjoy traveling and visiting craft breweries. I also enjoy swimming and genealogical research. What interests and experiences do you bring to JTCC libraries that will help you serve students and faculty? I was a children’s librarian for many years in my early library career. I have been using that knowledge and experience to build a curriculum materials center to support our education programs. I often draw upon my varied experiences in both the public and school libraries to develop outreach initiatives with other departments all while promoting the library and student success. Tell us a little bit about your position here. I am the OER and Instruction librarian for John Tyler. My passion for Open Educational Resources allows me to help faculty find the best resources to teach with and allows me to help students save money with little to no textbook costs. My instruction usually focuses on sharing research and evaluation strategies with students on campus. I also enjoy working with the faculty and staff to find ways for the library to collaborate with the various departments and programs around campus. What goals do you have for the library? I am continuing to develop an Early Childhood Materials Center to support our current education students as well as our alumni working in the education field. I will continue to find ways to help students and faculty. What are three things students and faculty should know about the library? There is no “dumb” question. The library staff is here to help you find the answer. The library is a source of unlimited knowledge and access. The library staff is here to help you be successful. What made you want to work in a library? I was born a bookworm, so it is only fitting that I would grow up to spend my working life in a library. I love being able to help people and to learn something new while doing it. On a more personal note, what is a favorite book of yours? I have too many favorite books. I will share that my favorite authors are Jane Austen, Louisa May Alcott and J.K. Rowling.